You'll be £12.99 closer to your next £10.00 credit when you purchase Chinese Hordes and Human Waves. What's this? Order within the next 10 hours, 15 minutes to get your order processed the next working day! The North Koreans' attack on their Southern neighbours in 1950 shocked and surprised the World already in the grip of the Cold War in Korea. The conflict rapidly escalated with China soon heavily involved on one side and the United Nations on the other. The author, then a young Gunner officer, found himself in the midst of this very nasty war. He describes in vivid detail the horrific conditions faced not just by all elements of the British contingent but also the Canadians, Australians, New Zealanders and South Africans who fought so well. The reader is given a clear insight of what it was like to be at the infamous Battle of the Hook, where UN troops held off ferocious massed attacks by the numerically superior Chinese. Few outside the war zone realised just how appalling and dangerous conditions were. As a qualified Chinese interpreter and, later, a senior military intelligence officer, the Author is well placed to analyse the causes and implications of the War, the reasons for the Commonwealth becoming involved, the failure of Intelligence and how the bravery of American troops on the ground counter-balanced errors of policy in the conduct of the War. The plight of prisoners-of-war, held with no regard for the Geneva Convention, is also scrutinised. 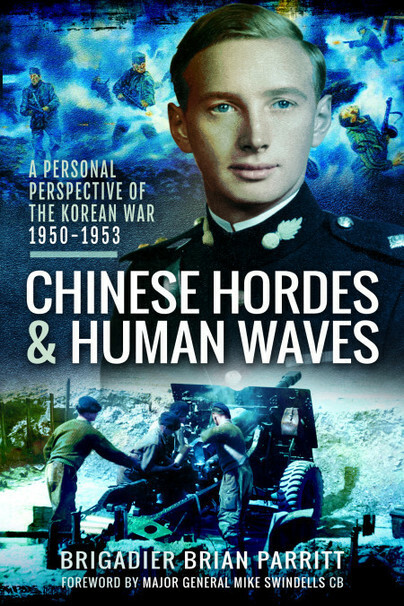 As well as being rare and gripping personal memoir, Chinese Hordes and Human Waves provides a valuable insight into the broader issues surrounding this alltoo- often forgotten conflict. "A most interesting book. Very readable and fascinating"
"Your book is quite fascinating and very interesting to read"
"The book certainly brings back many memories and some wonderful anecdotes long forgotten"
"I did not realize how much I had forgotten. A great read"
"The book has certainly brought back memories of my time spent in Korea"
"I have just read your excellent book and I must congratulate you on it. It's not often that I find myself reading a book so absorbing that I had to read it from cover to cover almost non-stop! I think yours is the first book about this campaign that I have read that gives due recognition to the presence and use of tanks. You have taught me more about the Korean War than I ever knew certainly while I was there and afterwards as well. I also enjoyed reliving my early days in the army which were so much as you described yours." In 2018 the nuclear threat from North Korea has never been more acute and a previously neglected conflict has now become highly relevant. Although the Korean War ended almost 65 years ago, in July 1953, a peace treaty was never signed and most of today’s geopolitical problems around the Korean Peninsula stem from its outcome. An American-led United Nations force successfully liberated South Korea, with Britain providing the second highest number of troops. However, the memory of the war has been unusually neglected in the UK, but as Brian Parritt’s fascinating and intelligent account shows, British soldiers fought extremely bravely and made many sacrifices. Chinese Hordes and Human Waves, Parritt’s own war experiences only make up the first part of the book. The other two sections are devoted entirely to a general history of the war, its causes, outcomes and lessons. For a historian, this structure means that the book is a unique resource that is well researched, intelligent and thoughtful. However, the most crucial aspect is that it was written from the perspective of someone who experienced the intensity of the Korean War. Parritt could have easily made the book entirely about himself, and it would have been a gripping read on its own. His own story is a fascinating insight into static fighting conditions that he reveals were similar to World War I, and he modestly downplays his own role to highlight the bravery of the men he fought with in ‘Baker Troop’. Nevertheless, the author skilfully uses his own experiences to create a unique secondary history that is also a primary source. Such combinations in historical studies are valuable and therefore make for essential reading. Parritt’s book is an excellent introduction to a complex war that is both personal and informative in equal measure. This is an important book, one that sheds further light on a war that is nowhere near as well known as it should be. This book should be widely read as a gripping personal memoir to expose a long forgotten conflict, providing a perspective to understand the Cold War and the legacy that still exists. The fun, fear and sadness.... are all exquisitely portrayed. It is a good and interesting read'. A highly recommend book that I found hard to put down. Highly readable and written with great modesty. 'The 80 year old's gripping and insightful account of a civil war that shook the world takes us into the heat of the battle and the heart of the war's causes and effects'. This excellent and useful short work about the Korean War, a very unpleasant and brutal conflict, now almost forgotten sets out to achieve two purposes. The first purpose is to describe the role and duties and day-to-day life of a young Royal Artillery troop officer in the war, in grim and violent fighting, quieter periods and a brief spell in hospital. Many accounts exist of the infantry’s experiences, here we learn a great deal about the support given by gunners, often in at least as much danger as the infantryman. Brigadier Parritt was himself a forward observation officer with an infantry company in one battle. He describes vividly, but modestly, the frightening nature of Chinese mass attacks particularly in the 1953 Hook battles. The reader will also be reminded of the splendid work of Australians, Canadians, New Zealanders, the South African Air Force Squadron and the Indian Army Ambulance from Commonwealth countries, and of course of the United States Army and South Koreans, soldiers and labourers. The comradeship and concern for others, from the Battery Commander down to the gunner in often in appalling conditions makes fascinating and inspirational reading. The second purpose of this book is to offer background and reflections on the Korean War as seen from the perspective of an officer in. and later Director of the Intelligence Corps, with a knowledge of Chinese, experience in southern Asia and skills in understanding and writing contemporary history. Chapters deal with all, foe and friend, who claimed to be victors in the war, and the political and international miscalculations that caused the war, with finally and especially valuable, two “war lessons chapters.” One analyses the manipulation of intelligence, with particular criticism of General Willoughby who had been MacArthur’s chief intelligence officer in World War with great success, but in 1950 succumbed to the temptation of providing intelligence that his chief wished to hear. The second describes the political propaganda use by the Chinese of the prisoners that they had captured. There were lessons in both interrogation and resistance to interrogation training to be drawn from this, the most important being that brutality in any form of interrogation is counter-productive, a lesson that had unfortunately to be relearnt in Northern Ireland. Chinese Hordes and Human Waves is well written, carries the reader along, and much wisdom is presented with a light touch. It also includes a fine selection of photographs and a useful bibliography. It is not without irony that in a year in which the media is already gearing-up the Country for the thirtieth anniversary of the Falklands War, there is little or no mention of a war that sixty years ago was at its height – a war of vastly greater scale, with much more at stake, the main ground campaign of which lasted three years rather than three weeks, and one with over three times the number of British servicemen killed, and almost a thousand taken prisoner. The Korean War is, of course, more distant in the memory, a war that lacked decisive victory and therefore cause for celebration, and a war where Britain, far from going it alone, was very much a junior coalition partner. But a war with much fierce fighting and sacrifice, and with considerable relevance for the British military today. The Korean War is characterised in popular history as a war of Chinese hordes and human waves. And although historians have debated the extent to which this is accurate, or a huge over-simplification, it is a depiction which recurs in the accounts of many who took part at, or close to, the front line. Brian Parritt is one of them, and with reason. As a newly commissioned Gunner subaltern, having wangled a posting to Korea, he found himself with his troop of 25 Pounders supporting a front-line battalion in one of the War`s fiercest battles – The Hook. In one night alone his troop fired nearly 2,000 rounds of defensive artillery fire. `Looking around the command post next morning, the pile of ammunition boxes was an unforgettable sight.` Not long after, as a Forward Observation Officer in a night attack, he was wounded by a mine which killed the three soldiers standing next to him and wounded eleven others. It will come as no surprise to those who know Brian Parritt, future Director of the Intelligence Corps, that amidst this chaos and without his torch, he was able to continue directing fire because he had committed the Fire Plan to memory. The author gives a vivid description through a subaltern`s eyes of life on the front line in the National Service army of the 1950s. Much of his account will resonate with those in today`s army: the long periods of inactivity interspersed with moments of adrenalin rush; the harsh climate and tough living conditions; the ubiquitous days-to-do `chuff charts`; the effect on morale of close friends killed; the lack of visceral hatred for the enemy. Other parts of his narrative are pieces of social history which emphasise the passage of time: the battery officers mess tent, replete with waiters, silver-service and an ever-open bar, `alcohol always available`; the fortnightly pay parade with monopoly-money vouchers; the wind-up gramophone with a single record (Mozart`s Clarinet Concerto). The second half of the book places this tactical-level account in context by focusing on strategic issues. Foremost amongst these, as befits the author`s expertise in intelligence, is a critical analysis of the major intelligence failures at the outset of the war. There was no shortage of indicators that a North Korean invasion was about to take place in June 1950, but these were discounted because they contradicted the accepted view of senior commanders both in Washington and in Macarthur`s headquarters in Tokyo that such an invasion was `unthinkable` - a situation repeated only four months later over China`s entry into the war. In analysing these failures, the author makes an intriguing comparison between the over-close relationship of Macarthur and his intelligence chief, Major General Willoughby, and, in an earlier war, Field Marshal Haig and his head of intelligence, Major General Charteris. He concludes that both intelligence chiefs manipulated intelligence to suit their commander`s wishes - `a lesson that is as relevant today as it was in the Korean War`. This book is therefore fascinating on a number of levels. It is not without its minor errors in the editing and proof-reading departments – Glosters readers will be non-plussed to read that their VC-winning commanding officer, Lieutenant Colonel Carne is named as Cairns – but these apart, it is a book that provides valuable insights into the War, and into warfare in general. It is highly readable, and written with great modesty. As the author of “Red with Two Blue Stripes” (the story of the India General Service Medal 1854) Brigadier Parritt is no stranger to Journal readers. This is a personal account of life as a young gunner subaltern and his baptisms of fire in the Korean War. The book is structured in three parts, beginning with the author’s perspective on the war itself, his fellow gunners and his own role in the fighting. Part Two – reactions to the War follows, leading to Part Three Lessons from the War: these provide a much wider insight into the broader issues related to this often-forgotten conflict. Apt indeed that publication just preceded the recent death of Kim-Jong-Il the “Dear Leader” of North Korea. There are ten pages of illustrations including many photographs from the author’s own collection. While not of overt medallic interest, there are interesting statistics on decorations and battle honours in the chapter entitled “Who won the War” and insights into specific acts of bravery. This is the story of his own military career as a young officer suddenly facing up to going to war with his own unit (his beloved Baker Troop) of the Royal Artillery and, finally preparing to leave a liberated South Korea. It has all the intimate incidents – small events in the overall conflict - that are part and parcel of the day to day life of an artillery troop, some mundane, some exciting, many difficult to imagine in the horror that was Korea! Much of this is very much a personal history. The British contingent were a mixture of Regular forces and National Service conscripts most of whom had never dreamt that they would ever have to take part in a real war. It was the first real test that the UN faced - almost World War III by proxy - with the South Koreans, the US and its Allies, Britain and the Commonwealth, taking on North Korea, backed by the USSR and China. The spectre of atomic warfare loomed large during the conflict. At the same time, intertwined throughout the book, the author gives a detailed, succinct resume of the war, including an assessment of who, in his opinion, won the war, deciding that possibly no-one lost with many, including the USSR, winning. Kim Il Sung, whom the author holds responsible for the war, backed by Stalin, was certainly able to claim that the North ‘had successfully resisted aggression, defeated the United States’ and were able to ‘implement his socialist dream’. On intelligence, he gives a summation of the failings (there were very few successes to record). Unfortunately there is little available yet on this subject with both GCHQ and NSA still remaining tight-lipped. Interestingly, he compares Brig. General Charles Willoughby who had been with Macarthur since the Pacific war with Charteris both of whom could be fairly accused of seriously misleading their Commanding Officers. The author analyses in some detail the lessons to be gained from the treatment and interrogation of prisoners of war and this sits validly in the book. Finally he reaches the conclusion that ’in the Korean War the (UN) soldiers did die in a worthwhile cause’. One outcome that justifies this claim is the South Korea that we now have compared to the appalling regime that exists in the North. A highly recommended book that I found hard to put down. This is an important book that can be appreciated by readers across all levels of understanding of political and military strategy, and may be used as a primer for many Americans whose exposure to what is often referred to as “America’s forgotten war” is limited to the television program M.A.S.H. It offers an engaging first-person account of the author’s entry into the military brotherhood, and his character-forming experiences in balancing the concepts of duty and honor against the realities of life and death during the bloody and confusing conflict in Korea. In addition, the author draws upon his expertise and experience as an intelligence professional to provide an insightful assessment of the key personalities, and their flawed political and military decisions, that led to and sustained this bloody conflict. Although it’s been 60 years since the armistice that “ended” the Korean Conflict, armed soldiers continue to be posted along the 38th Parallel that divides Korea into North and South. Even today, news media outlets report on the conflicting personal and political dynamics of the leadership of those countries, and their ongoing geo-political tensions. Chinese Hordes and Human Waves should be required reading for all American political and military leaders. This is especially true for those who may ultimately be responsible for crafting policies and programs to successfully engage the leadership of both Koreas regarding the future of their respective countries, and to avoid repeating the mistakes of the past. Brigadier Brian Parritt's experience of serving in Korea earned him a war wound and a decoration for bravery. His book offers not only a detailed personal insight into the fierce fighting that went on in the country during the early 1950s, but also puts the events into historical context for the reader by examining the causes, wider events and implications of the conflict, which has long been referred to as the 'Forgotten War' by those who took part. Brian Parritt’s book Chinese Hordes and Human Waves his personal perspective of his time in Korea, has awoken many memories of my own time in Korea. It brought back memories long locked away. In many ways it is a clear and understandable version the life for a National Serviceman serving in Korea. The fun, fear and sadness the utter boredom at times are all exquisitely portrayed. It puts his book way ahead of so many heavy tombs that have been written by “serious historians”. It is a good and interesting read. A fascinating insight into the mind and actions of a young man who while trained for military service and conflict, suddenly finds himself confronted with the real thing. I read this with much personal understanding as I too was in Korea at that time as Divisional Ammunition Officer of The 1st Commonwealth Division and therefore responsible for delivering all the ammunition required during some exceptionally heavy usage periods. The personal commitment and relationship between officer and the soldiers under his command exemplifies, as vividly illustrated by the many incidents he describes, the comradeship and loyalty always found in the British Army. Usually, combined with humour on both sides. The need to test and challenge assumptions - in this case especially, the assumptions that the Soviet Union would not allow North Korea to invade the South; and later that China would not become directly involved. The need for a close but candid relationship between the intelligence providers and their customers so that intelligence is timely and relevant, but not swayed to reflect the preferences of (in this case) the military commander. The need to understand the potential for different perspectives between intelligence staff in an operational theatre and those in capitals. Lessons which are as relevant today as they were in the 1950s.